My friend Daniel Shiu and I worked on this intermittently (one or two nights a week) for nearly three months. 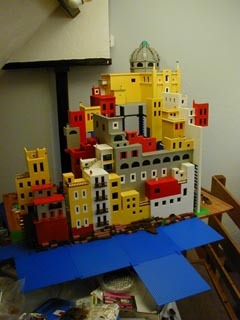 The model occupies a tabletop, about 4 feet by 5 feet, excluding the blue sea plates which hang over the front. The townscape only looks good from one direction - it's an elaborate facade, held up by scaffolding behind, as you can see in the pictures below. A significant part of the problem was figuring out exactly what distortion Escher had used to blow up the centre of the picture; firstly because we wanted to "undistort" the picture in order to be able to copy the townscape, and secondly so that we could transform our final photograph into something that looked like Escher's print. I tried several different ideas before I found one that produced plausible results. An unfortunate side-effect of the transformation is that the resolution suffers in the middle of the picture, where it's expanded by a factor of four. I'm using a 1.3 megapixel camera, and our initial results didn't look too great. 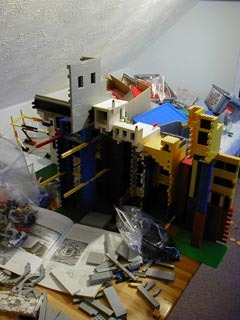 Our eventual solution was to take a number of separate shots, zooming in on distinct parts of the model, and glue them together as a mosaic panorama. The image above was constructed in this way from 16 images. The final Escher transformation was implemented in a custom C program that I hacked together. 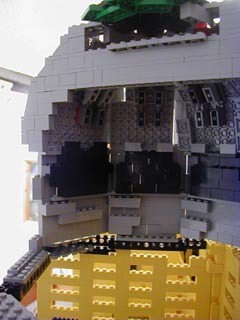 We were also rather constrained by the size of the model and the rather tightly defined position of the camera relative to it. Getting a reasonable picture involved considerable furniture rearrangement, some Very Very Careful shifting of the table bearing the model, much climbing over banisters (the table currently blocks the top of the stairs leading to the attic where the model resides) and, eventually, painting a chimney out of the picture's background. The shadows don't look right, of course. 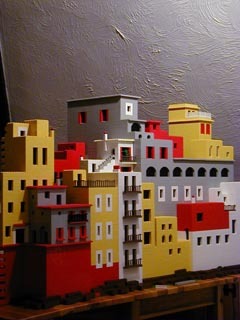 If pressed, our excuse is that we made the model at a different time of day than Escher made his picture! 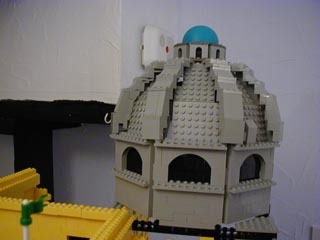 I'm quite pleased with the dome - and I finally found a use for the blue ball that appears in LEGO set 8269! 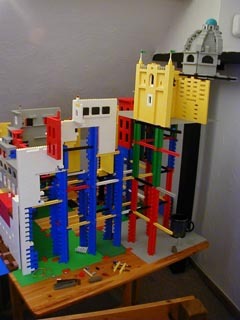 If you like this, you might also enjoy our LEGO rendition of Escher's picture "Belvedere". 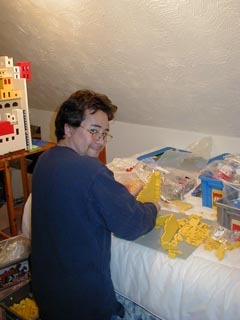 Daniel starting work on the cathedral building which appears at the top of the finished picture. The rocks at the base of the picture. 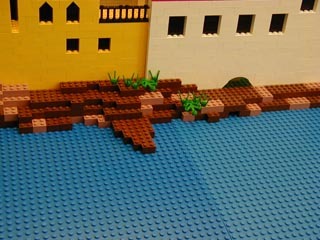 My first use of the new sand red bricks (I had just come back from a trip to LEGOLAND Windsor with a couple of packs). 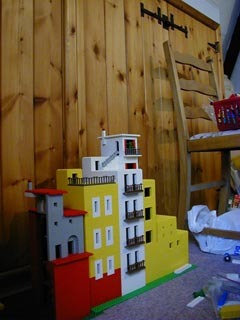 The finished construction - but photographed from the wrong place so you can see all the ways we cheated. 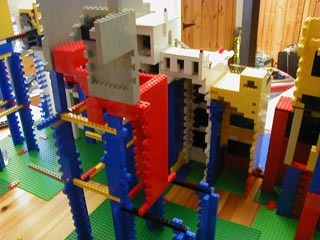 And finally, a view from the side, showing the elaborate scaffolding. 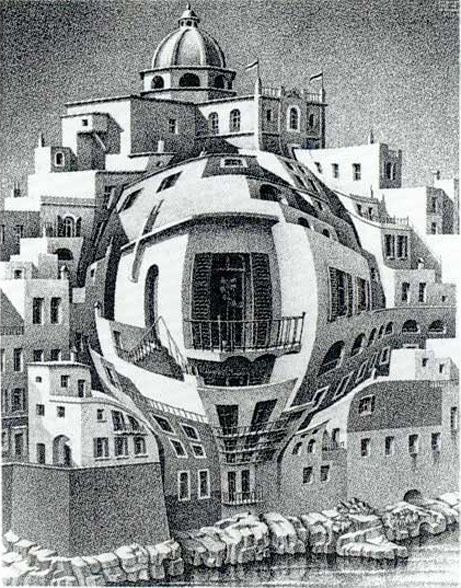 All M. C. Escher works (C) Cordon Art, Baarn, the Netherlands. All rights reserved. Used by permission. The official M.C. 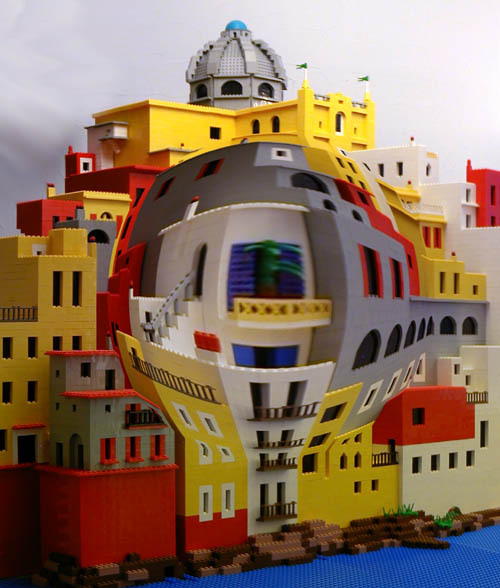 Escher web site is worth a visit. All other pictures on this page are Copyright © A. Lipson 2002.